Fox's Magee said that fans won't really see much difference between this incarnation of the simulcast and the one on MSNBC, except that the I-man's head will shrink from time to time (along with the rest of the frame) so that FBN can push more business headlines and market stats onto the screen. I am so glad to see poor 69 year old Imus getting back on TV.. and so glad to see him matched so perfectly with Fox.. but I don't think that I will tune in.. how about you? If I owned Fox I wouldn't hire Don Imus or Glenn Beck, Sean Hannity and Bill O'Reilly. But Rupert Murdoch will and has. As long as they make money for Rupert and push his politics, they'll have a job. Rupert knows how to sell his newspapers and cable news shows. Provide content that satisfies the emotional needs of the far right ideologues. Truth is not important. "Hate Groups Welcome." I never watched him or listened to him before. The few times I did it was slightly less exciting than watching paint dry. Yawn... Just another reason not to patronize any Fox "News" (or Rupert Murdoch) media outlet. The only thing I know about Imus is what happened to get him thrown off the air. So I may have a completely skewed perspective on this. That said, am I the only one who feels like Fox, known as the right-winged news network (i.e. the only one Christians should watch), is re-enforcing a long-held stereotype liberals have - that conservative Christians are racist pigs? I hear you mirror.. of course stereotypes usually say more about the people that hold them than the folks they are aimed at. I never watched/listened to him before so I don't see doing it now. I don't get Fox Business anyway. Now as far as calling him a shock jock - compared to Howard Stein and Mancow he's pretty tame, so I don't think that is an appropriate label. I thought his firing was appropriate. Bob, I'm waiting for you to start hammering MSNBC now - you want to talk about vile, have you watched to Keith Olbermann, Keith Olbermann or Rachel Maddow? I think it's hilarious that people commenting are picking up the bash Fox News meme - check out their news analysts and panel guests and I can guarantee you that they give liberals far more air time than CNN or MSNBC give conservative (or at least real ones anyway). I do hammer Olbermann on occasion even though I don't watch him.. of course I don't watch FOX cable or MSNBC at night.. MSNBC viewing is pretty much limited to Morning Joe. Didn't know about the bash Fox News meme.. who started it? El Rushbo? 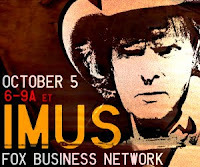 I have no problem with Imus being back on TV. He definitely played off stereotypes on his show -- in inappropriate ways -- but he always seemed more mainstream than extreme (unlike Beck and Hannity). According to this article Imus ratings have nowhere to go but up.